Who knows how many wedding ring sets are sitting around unused in dresser drawers? A woman in Kansas City recently traded her rings from a previous marriage for football tickets. Quality wedding ring sets for women don’t lose their value, even if they sometimes lose their emotional sentiment. The woman from Overland Park, Kansas, placed an ad on Craigslist offering wedding rings appraised at $3,100 for tickets to the Chiefs/Broncos game on December 1.The tickets were to be a surprise for her husband’s 40th birthday. Rusty Jones, of Northlander, Kansas, noticed the ad and contacted the woman. He and his girlfriend had been talking about getting married and had started to look at wedding ring sets for women. Jones met the woman at a jewelry store, where the appraisal was verified, and the woman left with tickets to two football games while Jones had his engagement and wedding rings. Jones’ girlfriend saw a picture of the rings on Craigslist and commented that she liked them, so Jones was good to go. However, many women prefer to choose their own jewelry, especially pieces that they will hopefully wear for the rest of their lives. If you are considering previously worn wedding ring sets for women, have the rings appraised and inspected by a reputable jeweler. Even great-grandma’s engagement ring could need some repairs and cleaning before it comes out of storage and into daily use again. Used wedding ring sets for women can be resized to fit the finger of a modern bride, but what about the style? If a family ring is damaged or your bride-to-be just doesn’t like Victorian filigree, many jewelers can place the stones in an up-to-date setting more in keeping with today’s active lifestyles. This way you can maintain the family connection while setting your own style. If you are interested in previously worn wedding ring sets for women, but don’t have any family heirlooms to choose from, you can often find older pieces at estate sales, auctions and antique dealers. In this case, it is especially important to have the rings inspected and their condition and authenticity verified by someone you trust. Unfortunately for the folks in Kansas City, the Broncos beat the Chiefs 35 - 28, but hopefully the rings were a success. 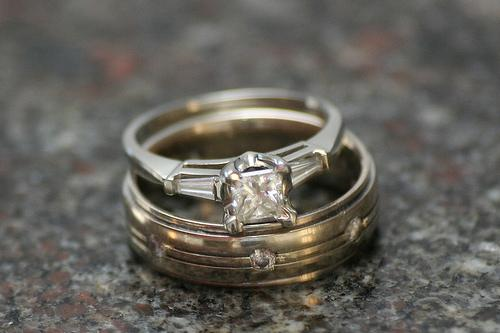 The artisans at Juno Jewelry can use your stones to create winning wedding ring sets. Call 213-291-9720 or email service@JunoJewelry.com to find out more.